Adopting a panda is a fun and easy way to have a direct impact on the daily life and care of our beloved pandas. 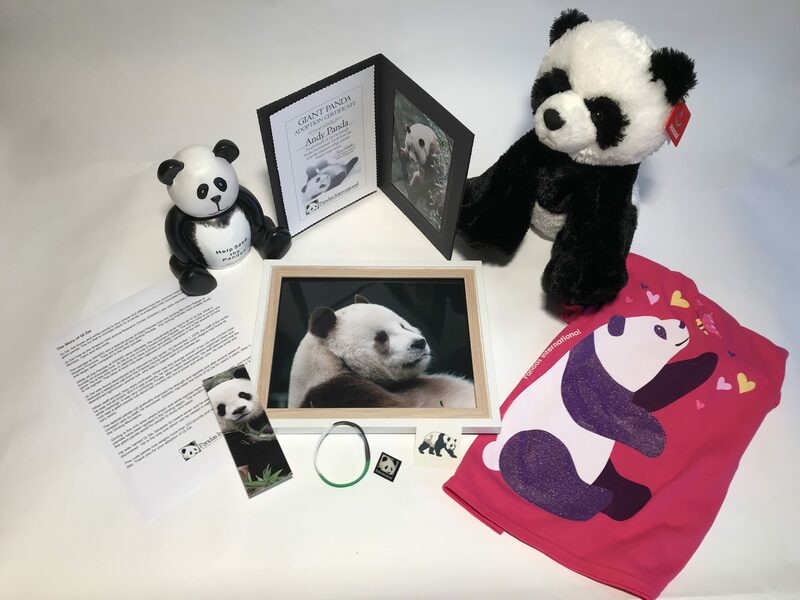 While it is a symbolic adoption (actual pandas have to stay in the Panda Centers in China) it is a meaningful way to help panda Conservation. 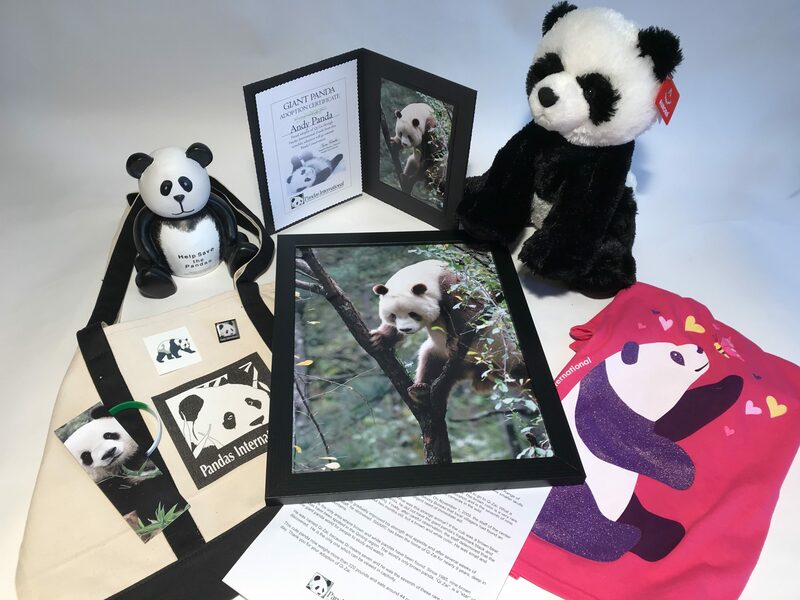 Remember, adoptions are also a great gift for the panda or wildlife lover in your life, and a great way to introduce children to panda conservation. 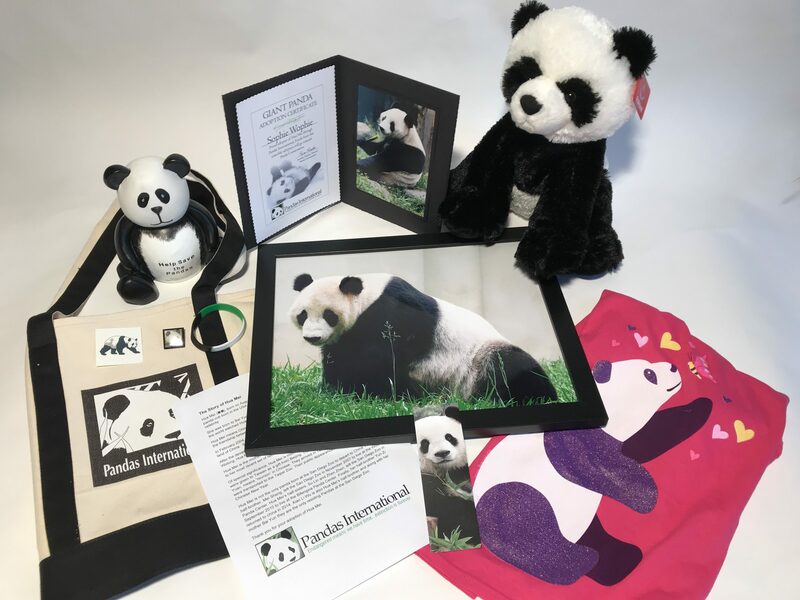 For adoptions at the $50.00 level or higher- If the adoption is for a child we will send a FREE Pennies 4 Pandas- panda protector kit, including a bucket, pin, brochure and a panda hat with ears- put panda protector kit in the comments box or email us at info@pandasinternational.org after you place your donation. The cost to care for a panda for one year is approximately $10,000. 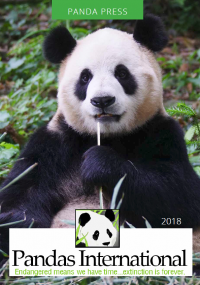 Your support provides critical funds for the pandas at the CCRCGP centers at Hetaoping, Shenshuping, Dujiangyan, Bifengxia as well as the SWARC center at Louguangtai. Your symbolic adoption donation helps to cover the costs of veterinary care, medicine and vitamins, the pandas’ daily meals (panda bread, carrots, apples, and lots of bamboo! ), formula for the cubs and the cost of the pandas’ caretaker staff. It is a wonderful way to give the pandas everything they need to thrive! 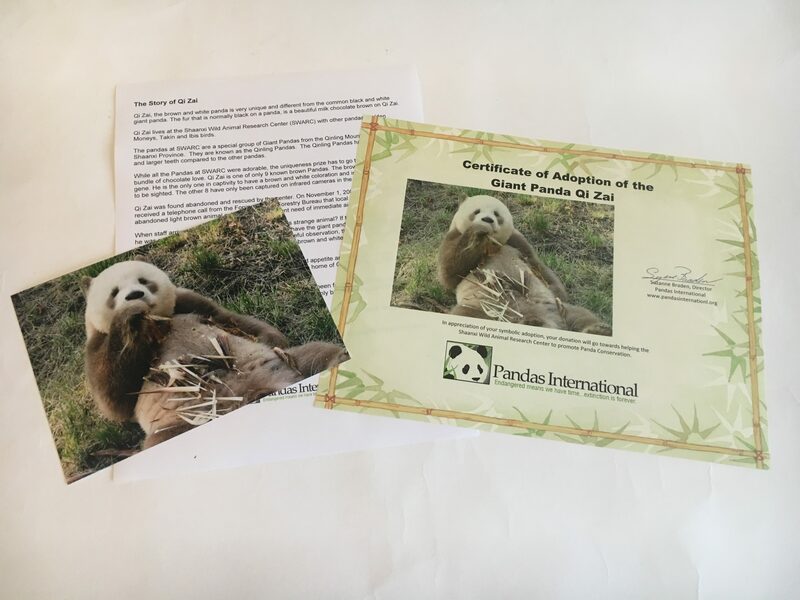 With this level you will receive a 5 x 7 photo of Qi Zai or Hua Mei (easy to frame), Qi Zai’s story or Hua Mei’s story and a symbolic adoption certificate. Free Shipping* in the USA. 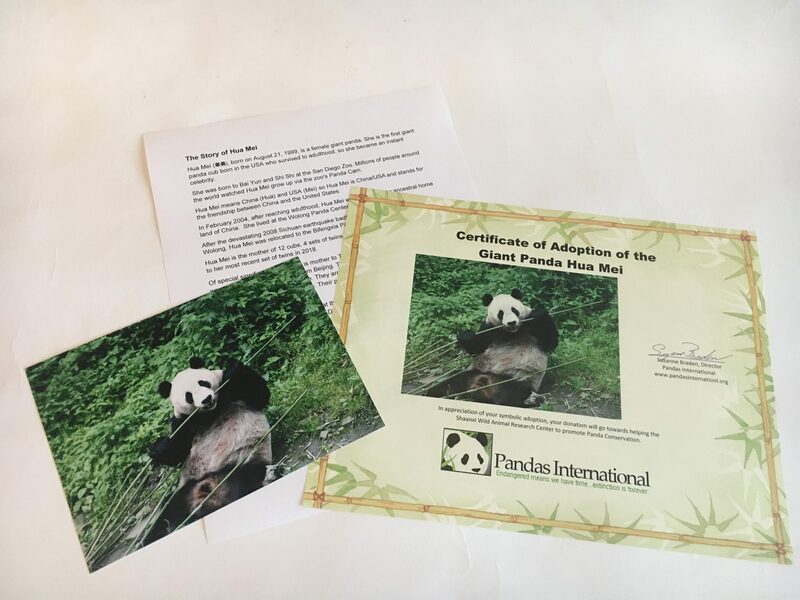 In order to receive any adoption items you MUST provide us with an address to ship to – please email us for international shipping rates at info@pandasinternational.org. *If your billing address is different from the shipping address, please enter the correct shipping address into the “write a note” box or e-mail us after your donation. 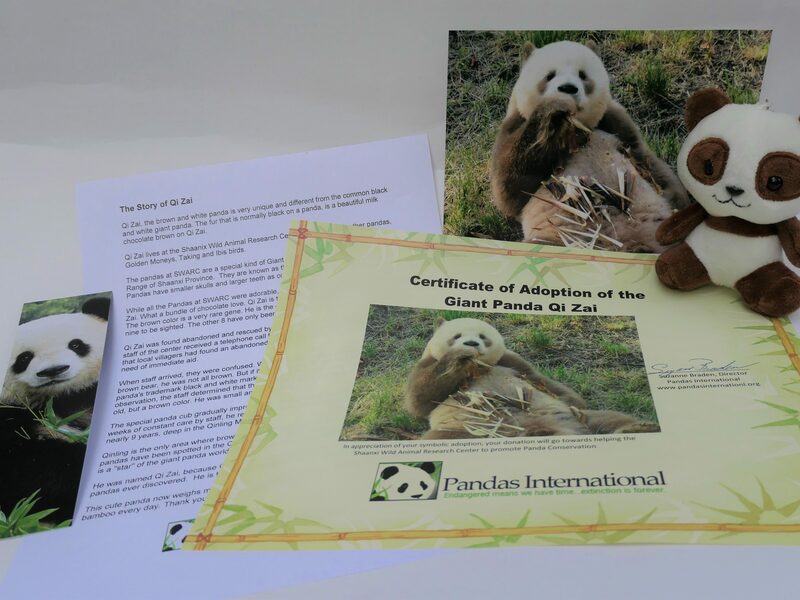 Adopters can choose to adopt either the Brown and White Panda named Qi Zai or the Black and White Panda named Hua Mei. 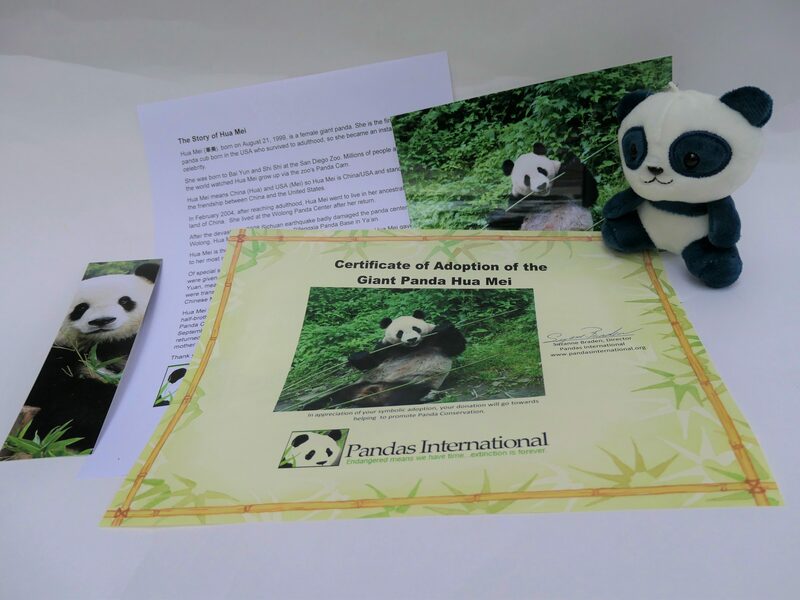 With this level you will receive a 5 x 7 photo (easy to frame), a small key chain panda plush, Qi Zai’s story or Hua Mei’s story, a bookmark, a temporary panda tattoo, a Save the Pandas wrist band, and a symbolic adoption certificate. *If your billing address is different from the shipping address, please enter the correct shipping address into the comments box or e-mail us after your donation. 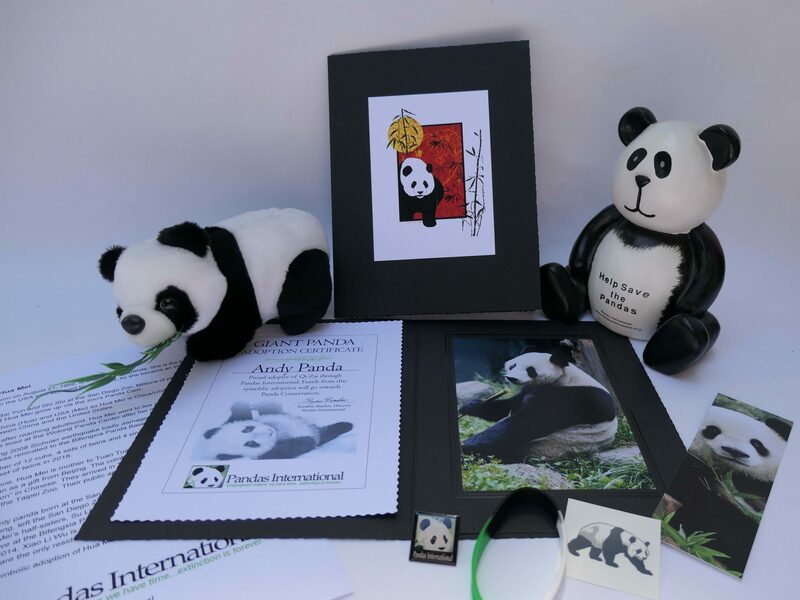 With this level you will receive a 5 x 7 photo and a personalized adoption Certificate (please include the name of the adopter in the comments box) in an adoption portfolio, a small Panda Plush with bamboo in its mouth, Qi Zai’s story or Hua Mei’s story, a bookmark, a temporary panda tattoo, a Save the Pandas wrist band, a panda pin and a panda bank. 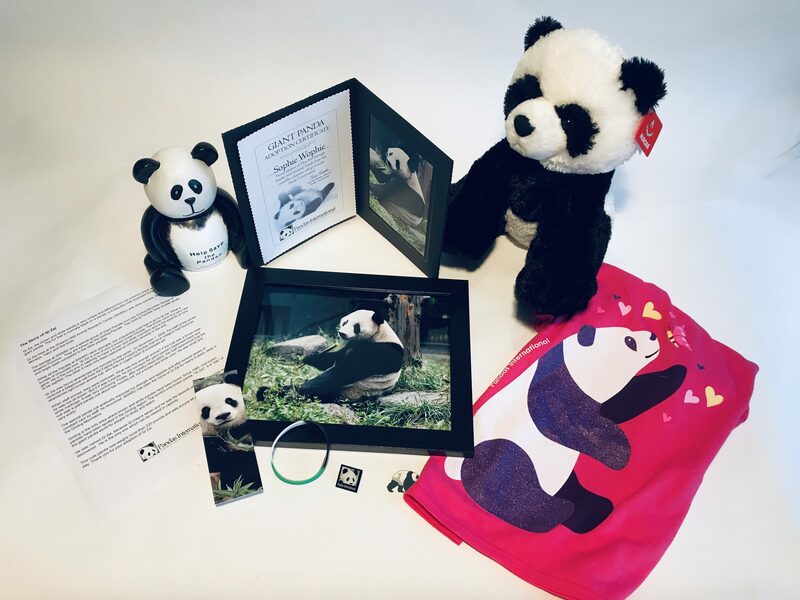 With this level you will receive a Framed 8 x 10 photo and a personalized Certificate (please include the name of the adopter in the comments box) in an adoption portfolio, a Large Panda Plush, Qi Zai’s story or Hua Mei’s story, a bookmark, a temporary Panda tattoo, a Save the Pandas wrist band, a panda pin, a panda bank and your choice of tee shirt from our website. We will contact you by e-mail after you place your donation in order to figure out your shirt preference and size. Free Shipping for all USA and International adopters. In order to receive any adoption items you MUST provide us with an address to ship to. 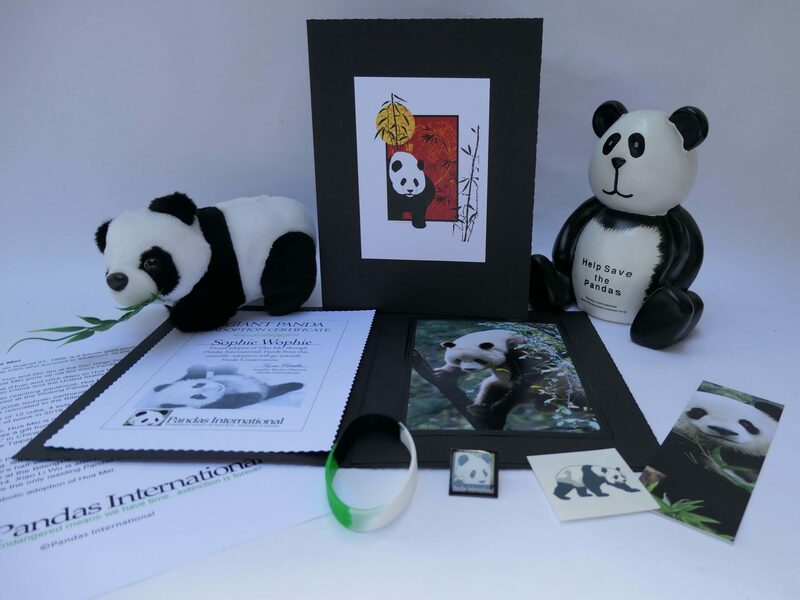 With this level you will receive a Framed 11 x 14 photo and a personalized Certificate in an adoption portfolio, Qi Zai’s story or Hua Mei’s story, a bookmark, a temporary panda tattoo, a Save the Pandas wrist band, a panda pin, a panda bank, your choice of tee shirt from our website (please e-mail us after making your donation to choose your tee) and a heavy reusable 100% cotton tote. Please click on the Platinum Adoption link below to see all of the benefits and obligations of this Symbolic Adoption.